Cut the chicken breasts into 2cm pieces. Season and place in a pan with 100ml cold water, 25g butter, the lemon, wine, the anchovy, the herbs, mace and nutmeg. Stick a clove in the cut side of each onion half and add to the pan. Set over a medium-low heat and stir regularly until the butter has melted. As soon as the liquid begins to come up to a simmer, cover and reduce the temperature to very low. The liquid should literally tremble rather than bubble so that the chicken is very gently poached. Cook for 25 minutes or until the chicken is white, tender and cooked. With a fork, mash together the remaining 10g butter with the flour to form a smooth paste (this is called a beurre manié). Set aside. Roughly whisk the egg yolk in a bowl and whisk in the double cream. Once the chicken is cooked, use a slotted spoon to transfer the pieces to a warm serving dish and loosely cover with foil. Keep warm. Break the beurre manié into small lumps and whisk into the chicken cooking liquid over a medium heat so it melts without forming lumps. Simmer briskly, stirring regularly, for about 5 minutes until the sauce has thickened slightly and no longer tastes floury. Strain it into a clean saucepan and reheat gently. Pour in the egg and cream mix, stirring all the time, and heat gently without letting it boil (or the egg will scramble). Once piping hot, mix in the cooked chicken with its juices and, if necessary, adjust the seasoning. 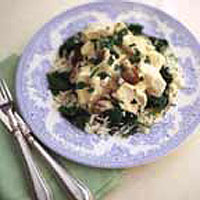 Serve immediately, scattered with chopped parsley, with rice and wilted spinach or fresh peas. This recipe was first published in Fri Aug 01 01:00:00 BST 2003.